In my earlier post, I have explained the best chrome plugins. In this post, I am going to tell you about the very useful chrome plugin ‘save to google drive.’ This plugin is used to save the web content and snapshots of the websites to your google drive. You can save the current web page by just clicking Save to Google Drive button to the right of the address bar. The format of the web page and the location is managed (explained later in this article) in the extensions option page. Save any images on the web page by just right click and save it to Google Drive. You can save any Documents, PDF, Audio, Video and any other files by just right click and save to Google Drive. 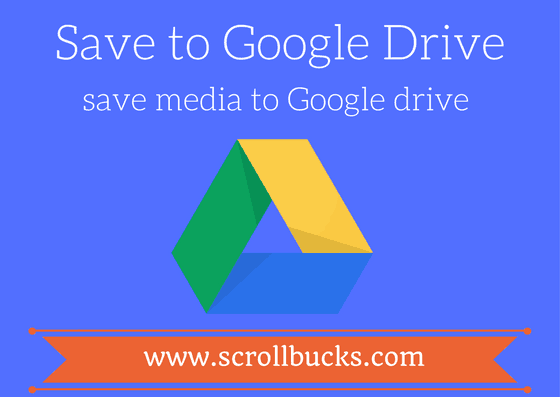 Install the latest version of save to Google Drive from the chrome web store. Once you installed it, you will see the Google drive icon on the top right corner. This icon will help you to save the webpage. To configure this plugin, right click on the icon and go to the option. Here you can set up your Google account, default folder to save files and web pages type. Once you setup all these things, it’s time to save something to your Google drive. Open any links, web page, images, video or audio, right click on file and save the link to google drive. Your link will be automatically saved to the Google drive default folder. If you want to save the whole web page, then click on the icon(top right side), your web page will be saved to Google Drive folder. In this case, you can see the progress bar, and you can rename the file after saving, also change the destination folder. You can save the media files by the same procedure. With the help of this plugin, you can easily convert the Microsoft office and.CSV file to Google Docs format. In this way, you can save the media, web pages for future reading. If you like this article, then share it with your friends.